If you dive into temperance history in the slightest, you'll run across the 6' tall figure of Carrie Nation (later changed by her to "Carry"). She is famous for going into saloons with a hatchet and destroying all the merchandise in the name of temperance. No one wanted to mess with her because she was a giant woman wielding a hatchet. Here's the thing. I always assumed she had just found a schtick and went with it. But the Carrie Nation episode of the hilarious podcast The Dollop, WHILE slightly reprehensible for dealing poorly with the extreme mental illness in her family, also entirely reframed her as a person and made her actions less "hilarious old woman has had enough" and much more "this was a person who needed help." Carrie Nation lived from 1846-1911. She was born in Kentucky to slaveholding parents. Her mother, some writers say (and The Dollop proclaims) thought she was Queen Victoria, and the family treated her as such. An aunt of Carrie's acted like a weather vane at times, and a cousin decided to just live on all fours for a time until the local minister had a talk with him. [It] seems clear in retrospect that her first and continuing impulse was to befriend the woebegone and homeless. In Medicine Lodge, Kansas, where she and her second husband, David Nation, settled in the 1890s, she was known as "Mother Nation"-not a name of irony or derision, but one that celebrated her generosity. In Kansas, as in the years before in Missouri and Texas, Carry's instincts were to look out after the poor and battered, especially women. Medicine Lodge saw her establish a sewing circle to make clothes for the destitute. Her strong belief in education (she was once a teacher) led her to make it her business that few children in Medicine Lodge had to stay home from school for want of proper clothing. Carrie was married for about a year to an alcoholic (he died soon after), from whom, if she DID contract it, she got syphilis. They had a daughter with mental health problems, which Carrie blamed on her husband's alcoholism, despite the storied history of her family. She remarried David A. Nation, and they went around the West as he tried career after career and she started taking rocks into bars and smashing all their stock. After she similarly destroyed two other saloons in Kiowa, a tornado hit eastern Kansas, which she took as divine approval of her actions. Carrie went from Kansas to Oklahoma, smashing up bars and rousing the local Women's Christian Temperance Unions to action. Bars started putting up signs saying "All Nations Welcome But Carrie." Throughout all this, she said she talked to God and He was directing her in what to do. She "sold photographs of herself, collected lecture fees, and marketed miniature souvenir hatchets" to support herself and, according to Wikipedia, pulled a Westboro Baptist because "[s]uspicious that President William McKinley was a secret drinker, Nation applauded his 1901 assassination because drinkers "got what they deserved." The further research I did after The Dollop's hilarious and informed, but pretty callous and using some suspect sources, podcast, pointed to the good she tried to do, and the book Carry A Nation: Retelling the Life states that newspaper reporters looking for a story reported that she died of complications from syphilis, while the hospital itself stated heart failure as the cause. It's extremely possible the hospital wanted to cover up that she had syphilis to protect her reputation, and it seems like it would explain some of her pacing, muttering to herself, and grandiose actions, but who knows. 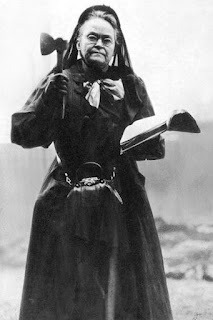 At the end of the day, Carrie Nation did some good things and some bad things. Her childhood with a very mentally disturbed mother sounds sad, her life with her alcoholic husband sounds sad, trying to care for her mentally ill daughter sounds sad, and her second marriage that ended in divorce in 1901 sounds sad. Her work for temperance at least gave her a passion and a drive in life, and while saying it was good the president was assassinated is The Worst, I hope she was happy at least some of the time she was here.